Choosing between solid and stranded conductors is one of the first decisions made in a custom cable design. There are two main choices a cable assemblies manufacturer has for the conductor when designing a custom cable: solid and stranded. The most basic difference is obvious when you peel back the jacketing and look at the conductors. 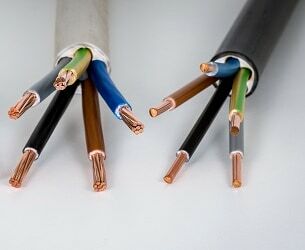 A solid conductor is made of one solid wire that is usually made of a single metal like copper. A stranded cable is made with many small wires (or strands) that are bundled together to create a larger conductor. There are pros and cons to using each type of conductor. We’ve listed a few of those below. Why would a cable assemblies manufacturer use a solid conductor in my custom cable? Solid conductors are simpler to produce which can translate to a more affordable custom cable. They are also more resistant to corrosion, which makes them more durable than stranded cables in certain conditions. This means they can be used in some applications that require heavy duty wires. In addition, these conductors can be smaller than stranded versions without compromising the ability to carry current. Their larger wire diameters mean they have a lower DC resistance and lower susceptibility to the effects of high frequencies. Because of this, they support higher data rates and longer distance transmissions than stranded cables. Solid cables are less flexible, which makes them more likely to fail if they are moved or bent frequently. This means they are not a good choice for applications where they will be required to bend or move often. What are the benefits of a stranded cable? One of the most obvious benefits of a stranded cable is that it’s more flexible than the solid counterpart. Any stresses that come from being bent or twisted are distributed to all of the strands. This makes a stranded conductor a good choice for cables that are frequently moved, bent, or twisted because they tend to be more resistant to damage and failure in these situations than solid conductors. If stranded cables are more durable, why not use them for everything? Cables with stranded conductors are not the best choice for every application. It’s important to work with your cable assemblies manufacturer to make sure the right components are used in your custom cable. For example, stranded conductors are more costly to produce so they may not be the right choice for your budget. However, in certain situations, their flexibility can make them a more economical choice in the long run because they will not have to be replaced as often. They can also be more susceptible to corrosion. So, it’s important to look at all the pros and cons to make the right decision. There are many choices a cable assemblies manufacturer makes when designing a custom cable. Because the conductor is the component that actually carries the current or signal, it’s important to make the right choice regarding type and materials. You can do your part by being very clear about all of the requirements of your equipment as well as the environment where the cable will be functioning. Armed with this information, your cable assemblies manufacturer will be able to make the best choices for your project. When you’re ready to discuss your next custom cable, contact the team at Meridian Cable. We look forward to talking with you.